The true wireless headphone market is seriously heating up. It seems like every day that there’s a new pair of true wireless buds ready to try and take on Apple’s AirPods — and this time, the contender even has the word “Air” in its name. The headphones are the Yevo Air true wireless headphones. 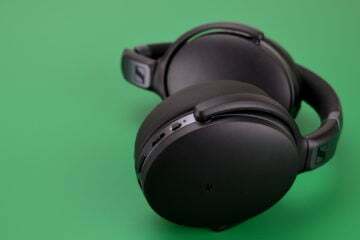 They come in at under $150, are relatively stylish, and could be the way to go if you’re looking for a pair of true wireless headphones on a budget. But are they the right choice for you? We put the Yevo Air true wireless headphones to the test to find out. Before even popping the Yevo Air headphones into your ears, you’ll notice the design, and they’re not bad-looking headphones. They’re very subtle in design, featuring a sleek black look, with a rubberized feel and a button on each cap. That makes it pretty easy to control things like playback and volume, as long as you’re willing to learn which button to press and how many times to press it. The included charging case is equally basic — though that’s not necessarily a bad thing. It features the Yevo logo on the top, is relatively small, and has a button on the front that releases a latch, opening and closing the lid. On the back, theres a MicroUSB port, which we wish was a USB-C port — it’s 2018, and it’s time to adopt new standards. Also in the box, you’ll find a MicroUSB cable and two extra pairs of ear tips. It would have been nice to get a few others, and perhaps a pair of memory foam tips — but at least there are three sizes to choose from. The Yevo Air headphones may not be all that flashy, but they’re still relatively sleek and stylish. True wireless headphones often have a tough time when it comes to comfort level, and unfortunately the Yevo Air headphones are no exception to that rule. It’s not that they’re uncomfortable — actually they’re not too bad — it’s that they, like many other true wireless headphones, can often find out. As with any earbud-style headphones, we recommend trying out the different ear tip sizes to find the size that’s right for you. Doing so will minimize the risk of the headphones falling out when you don’t want them to — but even then these headphones simply aren’t built for sports. Instead they’re built for normal day to day use without too much movement. In general, we want to see true wireless headphones get better at staying in the ears — but when they do, the Yevo Air headphones are generally fine in the comfort department. Ultimately, while you may be buying true wireless headphones for how convenient they are, sound quality is still an important thing to consider. So how do the Yevo Air headphones sound? Well, not the best. Let’s start with the bass, which is generally good-sounding, though slightly tame. The bass is relatively punchy, though we would have liked to see a slightly lower bass extension than what’s on offer here. The mid range is a little strangely-tuned. The low miss are slightly laid back, while it seems as though there’s a boost in the high miss, giving the overall sound a slightly radio-like tone. That’s further pushed by the highs, which are by far the weakest frequency range of these headphones. The highs are not only slightly cut, but there’s also little extension, meaning that cymbals sound dull and vocals simply don’t shine the way they should. In general there are a number of things we would have liked different about the way the Yevo Air headphones sound. The sound simply isn’t very exciting, and it seemed to distort relatively easily too. Safe to say, if you’re an audiophile, these aren’t the headphones to go for. True wireless headphones also often have a hard time in the performance department. After all, since they’re so small, battery life has to take a hit. The headphones themselves have a battery life of 3.5 hours, which is fine for true wireless headphones, but not spectacular. The battery case then provides an additional 14 hours of playback, or four full charges. According to Yevo, 15 minutes of charging will get the headphones 45 minutes of playback. The headphones connect to your listening device through Bluetooth 4.2, which means you’ll get a range of up to 10 meters, or 33 feet. We found that the Yevo Air headphones were pretty good at retaining a connection. In general, the Yevo Air headphones perform fine, but aren;t groundbreaking by any means. The Yevo Air headphone are clearly a decent choice for those looking for true wireless buds at a relatively good price. They’re decently well-designed and come in at a super cheap price — unlike many other true wireless headphones. But are they the best choice? Thanks to their lackluster sound quality and average performance, no. If you’re looking for a great pair of true wireless headphones in the sub-$150 price range, we recommend the JLab Audio Epic Air headphones for sports use, or the Soul X-Shock headphones for everything else. Still, thanks to their decent value for money, we’re awarding the Yevo Air headphones the Headphone Review Bronze Medal.